University of Agriculture, Makurdi, Nigeria. 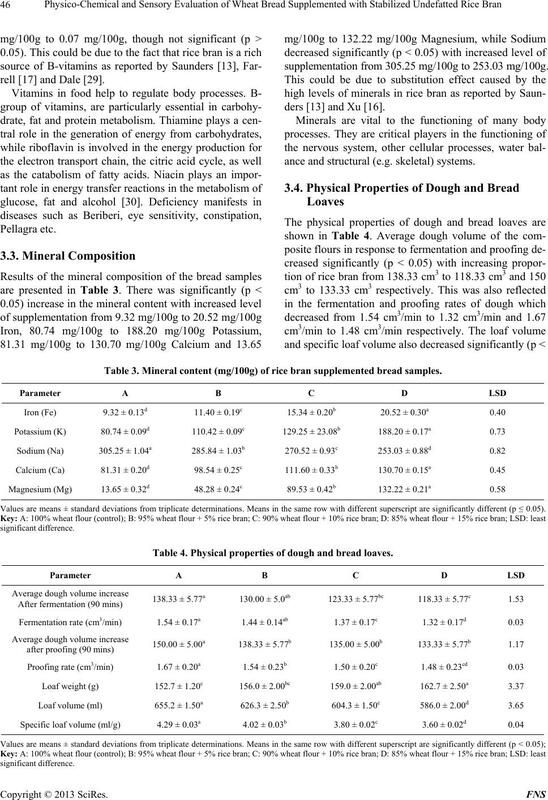 ferences (p < 0.05) in physical properties of dough and bread loaves between the composite bread and the control. 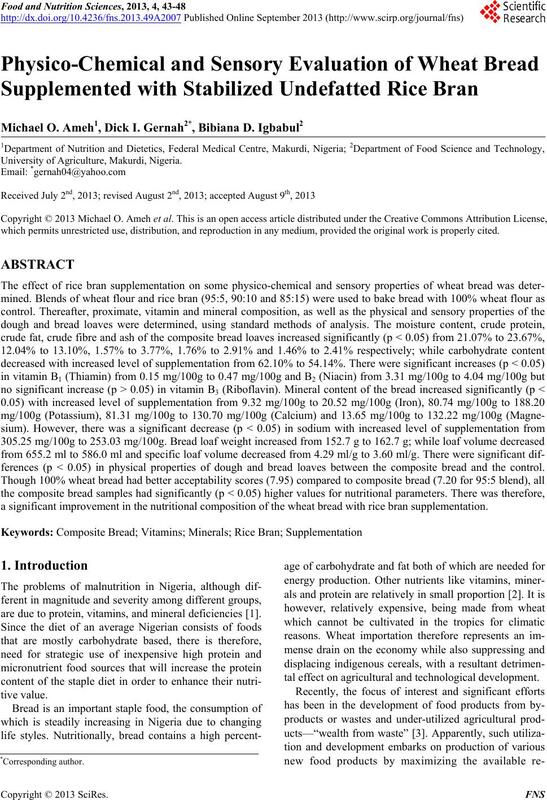 a significant improvement in the nutritional composition of the wheat bread with rice bran supplementation. are due to protein, vitamins, and mineral deficiencies . tal effect on agricultural and technological development. tried in bakery formulation with varying success. during the process of rice milling in this part of the world. cer, kidney stones, heart disease and hyperlipidaemia. reference to protein, lysine and dietary fiber contents . ern Market, Makurdi, Benue State. room temperature for future use. plasticized fat and covered with greased bread wrapper. volume was determined by the method of Giarni et al. as described by Mellgaard . tain body cells, while fat supplies essential fatty acids. and lowering of plasma cholesterol . Table 1. Proximate composition of rice bran supplemented bread samples (%). Table 2. 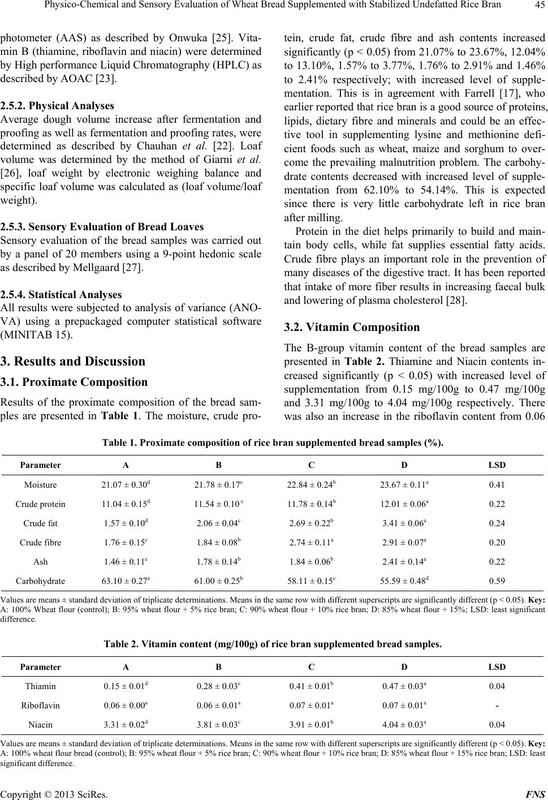 Vitamin content (mg/100g) of rice bran supplemented bread samples. supplementation from 305.25 mg/100g to 253.03 mg/100g. ance and structural (e.g. skeletal) systems. Table 3. Mineral content (mg/100g) of rice bran supplemented bread samples. Values are means ± standard deviations from triplicate determinations. Means in the same row with different superscript are significantly different (p ≤ 0.05). Table 4. Physical properties of dough and bread loaves. Table 5. Mean sensory scores of bread loaves. ml to 586.0 ml and 4.29 ml/g to 3.60 ml/g respectively. 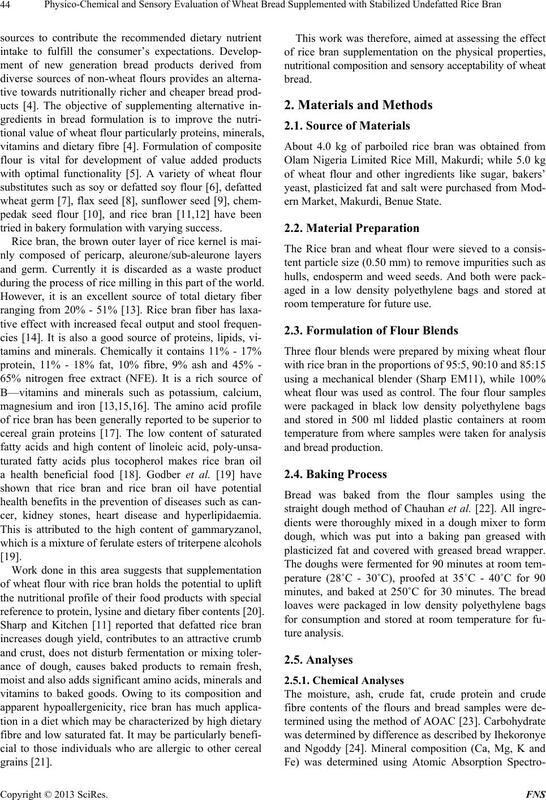 tion of rice bran blends from 152.7g to 162.7g. consumers because it is stomach filling and satisfying. posite flours of wheat and parboiled (stabilized) rice bran. 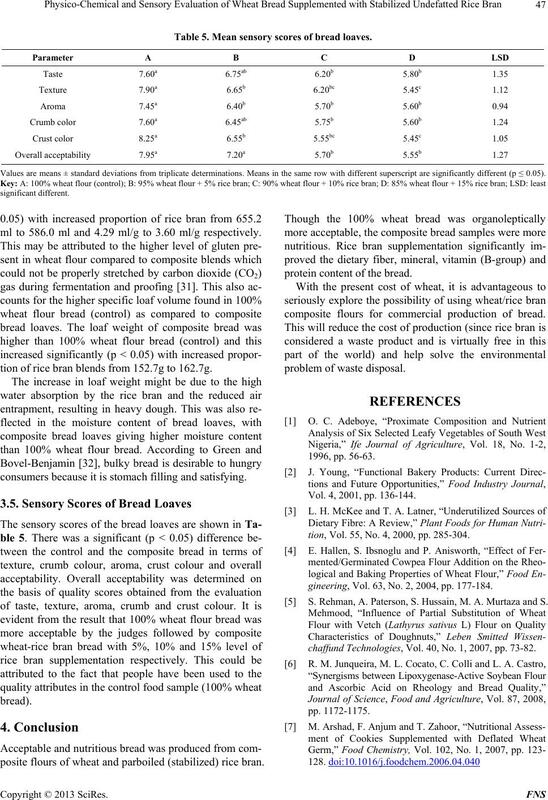 protein content of the bread. composite flours for commercial production of bread. Vol. 4, 2001, pp. 136-144.
tion, Vol. 55, No. 4, 2000, pp. 285-304.
gineering, Vol. 63, No. 2, 2004, pp. 177-184. S. Rehman, A. Paterson, S. Hussain, M. A. Murtaza and S.
chaffund Technologies, Vol. 40, No. 1, 2007, pp. 73-82. 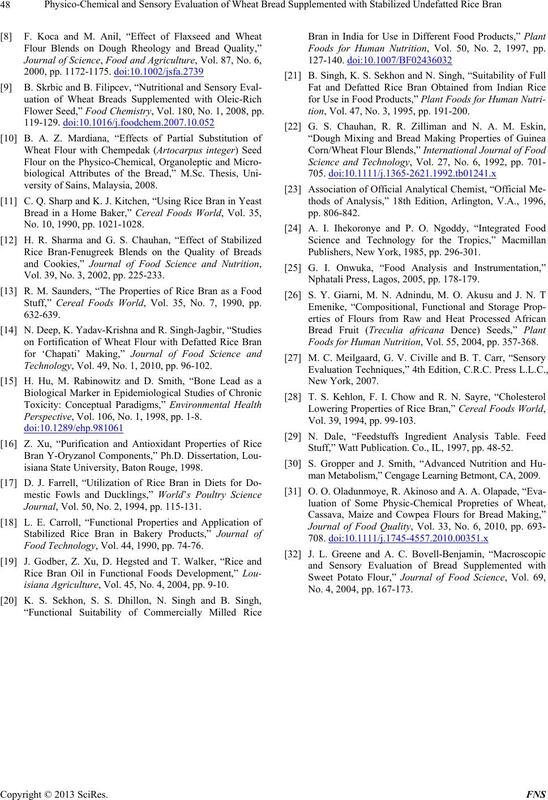 Flower Seed,” Food Chemistry, Vol. 180, No. 1, 2008, pp. versity of Sains, Malaysia, 2008. No. 10, 1990, pp. 1021-1028. Vol. 39, No. 3, 2002, pp. 225-233. Stuff,” Cereal Foods World, Vol. 35, No. 7, 1990, pp. Technology, Vol. 49, No. 1, 2010, pp. 96-102. Perspective, Vol. 106, No. 1, 1998, pp. 1-8.
isiana State University, Baton Rouge, 1998. Journal, Vol. 50, No. 2, 1994, pp. 115-131. Food Technology, Vol. 44, 1990, pp. 74-76.
isiana Agriculture, Vol. 45, No. 4, 2004, pp. 9-10. Foods for Human Nutrition, Vol. 50, No. 2, 1997, pp. tion, Vol. 47, No. 3, 1995, pp. 191-200. Publishers, New York, 1985, pp. 296-301. Nphatali Press, Lagos, 2005, pp. 178-179. Foods for Human Nutrition, Vol. 55, 2004, pp. 357-368. Vol. 39, 1994, pp. 99-103. Stuff,” Watt Publication. Co., IL, 1997, pp. 48-52.
man Metabolism,” Cengage Learning Betmont, CA, 2009. No. 4, 2004, pp. 167-173.